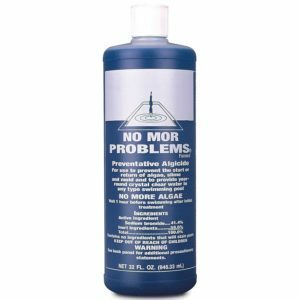 If you are having constant algae issues and want to try a preventative algaecide treatment that works, we recommend No Mor Problems, available in a quart or gallon at either of our locations. Put a little or a lot (Read the directions, of course)! This product will not only prevent algae growth but will destroy algae already in your pool. If your pool water is properly circulating and filtrating, properly sanitized and you still have algae growth, you need No Mor Problems! If your pool water is properly sanitized, circulating and filtering correctly and you still have algae growth, you need No Mor Problems!